Indeed, it appears only when the tab with the game is active, if you're using another tab, memory use stays 'correct'. In addition, explicit memory is pretty low but private memory grows up very fast. I'd guess it's something to do with hardware acceleration. Can you try going to about:config and setting layers.acceleration.disabled to true and see if that makes a difference? > see if that makes a difference? 1st test: I disabled completely HWA in advanced options in FF. Result: no high use of memory, normal behavior. 2nd test: HWA was on but layers.acceleration.disabled = true. Result: high use of memory as I reported in comment #1. > 1st test: I disabled completely HWA in advanced options in FF. > Result: no high use of memory, normal behavior. > 2nd test: HWA was on but layers.acceleration.disabled = true. > Result: high use of memory as I reported in comment #1. Thanks, Loic. So, HWA of layers is causing the problem. Looks like this is either a layout or graphics problem, I've CC'd some relevant people. Nick, will you have a chance to look at this soon? njn: sorry, didn't get onto this yesterday or today, hopefully I should be on it tomorrow or Monday, is that OK with you, timing-wise? > on it tomorrow or Monday, is that OK with you, timing-wise? I confirmed the reported behaviour on FF 12, memory use rises until FF crashes (annoyingly taking my display driver with it). But this is resolved on version 13 (current release) - here memory rises but falls again with GC, admittedly with some pretty brutal GC pauses. No crash, no excessive memory use. Things are even better on 14, GC pauses are smaller and so is memory use, still no crashes. Works fine on nightly (16) too. > use, still no crashes. Works fine on nightly (16) too. That's not really what I'm observing on Win 7 with the latest Nightly build. During the game after 15-20 sec, Nightly's process hit the barrier of 3GB, my computer starts to freeze. > > use, still no crashes. Works fine on nightly (16) too. > That's not really what I'm observing on Win 7 with the latest Nightly build. > my computer starts to freeze. I guess you meant about:support. I tested with a new Firefox profile each time. + Beta: FF14 eats the memory (close to 2.3-2.5GB), starts being unresponsive then crashes. + Aurora: Same behavior than FF14, but after being unresponsive a 1st time, FF15 returns control a 2nd time but it's almost impossible to move the mouse cursor. Then FF15 crashes. + Nightly: FF16 eats more memory (~3GB) than FF14/FF15 but becames unresponsive then returns control and it's smooth at 90% after that. No crash. I think FF16 eats more memory so it's more smooth after the 1st hang. I have to say the computer didn't really appreciate these tests, I had to reboot because applications were slow even if testing was over. Thanks for the data Loic, and yes I meant about:support, sorry. So the only difference I see here is that you are using integrated graphics card (the Intel one). I use only discrete graphics (nvidia), so I rebooted with the integrated Intel GPU, and indeed, I get the same behaviour as you report - quickly escalating memory usage, leading to a crash. On Nightly I get the occaisional GC which slows things down, but not by much - I still get the crash, it looks like not one GC happens before I crash on beta (14). So it looks like this is caused by some combination of HWA rendering and integrated graphics card, or possibly some issue with a specific Intel card or its driver (about:support shows "Intel(R) HD Graphics Family" for me, not sure if that is due to an older driver and we have the same card, or we have different cards). At least I can recreate the bug now, I will look into it. So, it seems that things aren't being leaked as such, when you pause the game or force a GC from about:memory, then the memory use goes down to reasonable levels. It just seems that GC isn't getting a chance to run or something. I have no idea why changing graphics cards or layers backends would affect this though. We call JS_updateMallocCounter in nsCanvasRenderingContext2D(Azure) to tell JS that we've allocated non-JS-heap memory for canvas buffers that it needs to take account of in its GC-triggering heuristics so that GCs will be forced to happen so we can release these buffers. It sounds like something related is happening here, maybe, and something is allocating a lot of video memory and not telling JS so we're not doing timely JS GCs. You need a comment somewhere explaining why you're doing this. increased the number of drawn gradients (still doesn't actually cause a crash on Try, but it does when run locally with the right (wrong?) graphics card). Carrying r=roc. So, I think this is the wrong solution. First of all this will create a global record without any intelligence which could definitely cause performance issues and pitfalls once we start re-using gradients more actively. More importantly once we get other backends that also cache information for GradientStops they'll need similar logic. The mistake of creating too many GradientStops here is really in the user of the API. As such I believe this sort of logic should go inside the canvas implementation. A dumb record there might be okay as web authors can then just improve their implementation, and it also can't interfere with UI responsiveness. I tried Bas's suggestion of removing the D3D10_RESOURCE_MISC_GDI_COMPATIBLE flag from the D3D10 Layer manager code. This prevented the crash and the explosive memory growth, but it did not cure the appalling GC pauses. The fix is therefore OK by itself if we assume GC will naturally improve. Otherwise, we could combine it with the cache limit patch, but with a higher limit. Opinions? > fix is therefore OK by itself if we assume GC will naturally improve. I'm personally in favor of just removing D3D10_RESOURCE_MISC_GDI_COMPATIBLE and going from there. I'm not 100% sure how I feel about the GC pauses. > I'm not 100% sure how I feel about the GC pauses. Maybe Bill or Gregor have some ideas how the GC performance could be improved? roc's comment 15 about JS_updateMallocCounter sounds right to me, not that I know a huge amount about it. > you will get a log of what the GC is doing. Hm I can't reproduce the OOM situation with a current nightly. After a few min I am still at around 220MB resident size. Gregor: you need to have the particular Intel graphics hardware, and maybe some particular driver. Nick: If you remove the D3D10_RESOURCE_MISC_GDI_COMPATIBLE but change nothing else on trunk (no JS_updateMallocCounter or other GC-related changes), does the problem just go away? Bas: what are the consequences of removing D3D10_RESOURCE_MISC_GDI_COMPATIBLE? In reality, nothing. As a matter of fact I should have done this a long time ago and I should really do it in more places. We don't actually use this anywhere with Azure-D2D. Without the fix GC pauses were up to 9sec. With Bas's fix, with a debug build, initially there is no problem, but GC pauses get longer as you play the game, getting up to 1.5sec, but many shorter pauses frequent enough to make the game unplayable. With an optimised build, there is no noticeable GC (I played for about 7-8mins, for debug, it is unplayable after 2-3). The longest logged GC was about 25ms. With a limit on the number of gradients, there was no GC issue, even on debug. How about taking the D3D10_RESOURCE_MISC_GDI_COMPATIBLE fix until/unless we have more data to justify taking the approach in your patch? I'm pretty confused here. First, are there enough calls to JS_updateMallocCounter right now? Does removing this D3D10_RESOURCE_MISC_GDI_COMPATIBLE flag just cover up another problem where we allocate a lot of memory and don't GC? Also, do we need to do anything to fix GC pauses? Do the pauses only happen with the special graphics card, or with any card? Did the pauses ever happen with an optimized build? Measuring GC pauses in a debug build is pretty useless, since we do all sorts of extra heap walking after the GC finishes to verify correctness. No, I think we need more, the problem is that we have no idea how much memory is being used - it changes depending on the driver. > we allocate a lot of memory and don't GC? I'm not exactly sure what removing that flag does. I think leads to much less memory being allocated. Yes, we did get pauses on optimised builds without the fix (around 1/2 second), but only on specific drivers, and actually it usually crashed before we saw many. > > JS_updateMallocCounter right now? > memory is being used - it changes depending on the driver. Is that because the driver is the one allocating the memory? It's not really that important that the number passed to JS_updateMallocCounter be correct. As long as you can make up a number that's close, it's better than nothing. All this call does is decrement a counter that starts at 100MB. When it reaches zero, we GC. > before we saw many. Could that have been due to paging? > > > JS_updateMallocCounter right now? > > memory is being used - it changes depending on the driver. > Is that because the driver is the one allocating the memory? > counter that starts at 100MB. When it reaches zero, we GC. The amount would vary from 16k to 200k, and possibly no memory at all if the gradient is never created. Usually in graphics memory, not main memory, not sure if that affects things. > > before we saw many. > Could that have been due to paging? Do you mean the pauses? They were GC pauses - logged at 0.5s. Are you going to remove the other uses of this flag? I think Bas wanted to. > Are you going to remove the other uses of this flag? I think Bas wanted to. Attachment #643422 - Flags: approval-mozilla-esr10? Attachment #643422 - Flags: approval-mozilla-beta? Attachment #643422 - Flags: approval-mozilla-aurora? I observed more or less the same behavior before the patch landed, maybe slowings appear later, anyway the memory use is still growing up and Firefox finishes to become unresponsive. My laptop fan runs more and the Intel chipset becomes hot. That is worrying, it sounds exactly like the pre-patch behaviour. I'll try with a nightly again when I re-config my graphics cards. The behaviour was definitely fixed for me when I tested last week. I just tried again with a nightly build, built from m-c, pulled 25/7/12, and the memory use was fine, never got above 150k (checked with task manager), and no crash. Are you using Optimus? That is the only difference (that you can see a 2nd graphics card) I can see from your about:support dump further up. 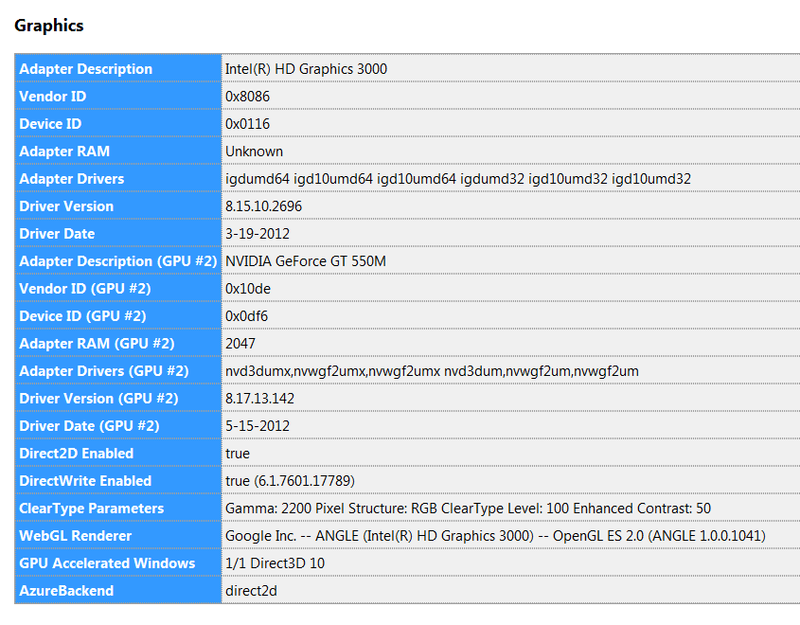 If you are, could you test with Optimus disabled and just the integrated graphics card? If it is not that, then I am out of ideas. Bas, any clue? No, I don't use Optimus with Firefox because Firefox has blocked the GPU drivers (NVIDIA GeForce GT 550M / 8.17.13.142 / 5-15-2012) and as I want to have HWA enabled, I have selected the integrated graphics for Firefox in Nvidia config manager. Hmm, I have no idea then. You have more recent drivers than me, by a few months, and a different (but similar) device id. I don't see the information about GPU #2 (I've only seen this with Optimus on, which is why I thought of that, but you are right that you wouldn't get HWA with Optimus). Otherwise our info is identical. Bas, roc: any ideas what could be causing Loic to still have problems when I don't? Loic, can you try a build from the try-push in comment #20 and see if that fixes the problem for you? > fixes the problem for you? I can try but I'm not familiar with try-push. Is there a link to download a zipped try-build (standalone version)? > > fixes the problem for you? > zipped try-build (standalone version)? > > > fixes the problem for you? > > zipped try-build (standalone version)? I tried with this try-build (the zipped version, firefox-16.0a1.en-US.win32.zip) and the resident/private memories stay normal (~ 280-300 MB during 2-3 min of game). So it sounds like we still need that patch. > So it sounds like we still need that patch. I'd rather like to understand why this is still happening for Loic, to make sure only affected hardware gets this path. Bas, roc - as the only other Windows users I know of, could you try and reproduce this bug please? > our info is identical. Is there an intel driver version difference? > > our info is identical. > Is there an intel driver version difference? Yes, we have slightly different hardware, Loic has 0x0116 and I have 0x0126. We have the same drivers, but he has a more up to date version (I guess they could have regressed, I'll try to update my drivers). I don't have an Intel GPU, only Nvidia. I don't see the bug. Before the patch, at worst memory usage creeps up to ~500 MB, GC takes several seconds (5-10). After the patch, at worst memory usage creeps up to ~400 MB, GC takes a couple of seconds (1-2). Note I manually applied the patch to my local tree to make sure nothing else interfered. In both cases the experience of the game is affected by the GC obviously. I can't get memory to go anywhere near 1GB on this machine. I updated my drivers and tried testing again with current nightly - still no bug. > couple of seconds (1-2). > can't get memory to go anywhere near 1GB on this machine. Was that with a debug build? Otherwise those GC pauses are huge (and worrying). Could you guys post GC logs? Even a one second GC pause is terrible. I don't understand why this is happening. GC times should be related to the number of JS objects allocated, which should be independent of graphics hardware. When I run the game myself, it seems to allocate almost nothing in the JS heap. When you run the game, do you also have tons of other tabs open? Do GCs normally take multiple seconds for you? > Could you guys post GC logs? Even a one second GC pause is terrible. > normally take multiple seconds for you? No, the log has been recorded with the latest Nighlty, only one tab open, this one with the game. When I'm moving the game cursor with the arrow keys, resident use increases, sometimes memory use relaxes but after 1 or 2 min, resident use grows up to the max and Nightly starts to not respond. It doesn't appear that we have enough data about user pain to take this past Aurora 16. Not worth the possibility of regression (even though we feel this is safe). Thanks, Loic! This clears up some of my confusion. All of the time spent in these GCs is in the end_callback phase. That's where we call destructors on C++ objects whose JS wrappers have been swept during the GC. So there are some Gecko objects involved here that are very expensive to clean up. Bas, if you're able to reproduce the slow GCs, you should be able to figure out which destructors are hurting us by profiling. The stacks of interest will have XPCJSRuntime::GCCallback in them. We know that the GC pauses are caused by tidying up gradients. The patch which landed mostly fixes this, and GC is back down to reasonable levels (unless Bas was running an optimised build, in which case, more mystery). The only problem is why Loic still sees the old (bad) behaviour even with the patch. Oh, OK, thanks. I hadn't understood that. Loic: are you still getting memory problems from this game? (Sorry I've lost track of this bug for a while, if you are still having problems, lets reopen it). I tested with the latest Nightly: with HWA enabled, it's not fixed but if I disabled HWA, the resident memory use is normal (even if CPU charge growns up). Probably an issue with Intel drivers. Re-opening because this is still a problem. We should land the patch which limits the number of cached gradients, but we should only do this where necessary. That depends on the driver, so we need to know which drivers are affected. Worst case, we can use the code for all Intel drivers, but it would be nice to be more precise because not all Intel drivers are affected, and there might be performance downsides to limiting caching unnecessarily. Is it still the problem or we can close this bug as RESOLVED? > Is it still the problem or we can close this bug as RESOLVED? I'm afraid I don't know, sorry (I no longer work on graphics). Maybe Robert O'Callahan [:roc] will know. If I understand correctly, only Loic could still reproduce this. > If I understand correctly, only Loic could still reproduce this. I can't reproduce the memory use anymore when playing the game.